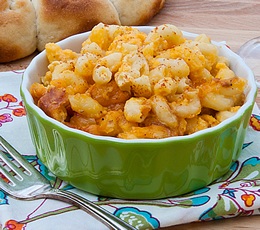 What a great way to make a homemade mac n cheese, if you’ve got the patience! Thanks to Laura with realmomkitchen.com for this recipe. Cook macaroni according pkg. directions and drain. Spray a 4-quart slow cooker with cooking spray. Add the macaroni, evaporated milk, milk, butter, salt, pepper, eggs and all but ½ cup of the grated cheese to the slow cooker. Stir to combine. Sprinkle the reserved ½ cup of cheese over the top of the mixture and then sprinkle with paprika. Cover and cook on low heat for 3 hours. Turn off the slow cooker, stir the mixture and serve hot.